Dorcas Casey                Louise Seijen Ten Hoorn                                                                       process have led to an almost complete freedom of materials and process. and buttocks carved from stone or ivory, and are assumed to be fertility ﬁ gures. Aris Katsilakis             Mette Fruergaard-Jensen                                                                       where it was found in 1908). 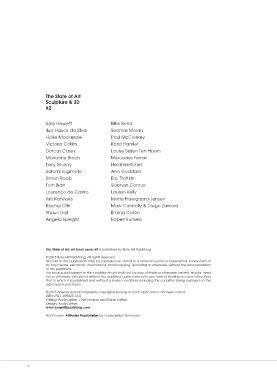 The State of Art, art book series #2 is published by Bare Hill Publishing. carved sculpture, underwent a major revival during the Renaissance. © 2015 Bare Hill Publishing, All rights reserved. © 2015 Artwork and photography copyrights belong to each artist unless otherwise stated. Editing: Andy Laffan, Chris Hodson and Robin Laffan. the sculpture they are creating today.